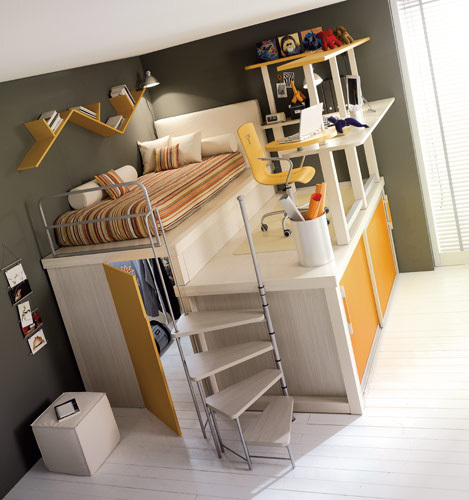 Loft bedrooms are very practical and perfectly suit for small kids rooms. Loft furniture provides great functionality, but at the same time allows to save the space. Timidey Spa offers a lot of modern loft kids bedroom furniture sets to create ergonomic kids area. Below you could find several cool solutions for boys rooms, which are characterized by quite sober, but still bright designs. These boys bedrooms demonstrate perfect kids room layouts, which are capable to satisfy all boys needs and wishes. Many of them are made for two children because of the clever kids zone separation. The boys furniture from this company surprises by awesome and very creative ideas. The designers place beds over closets, desks under beds and etc. All of them are comfortable as for sleeping as for studying. You could find the further information on Timidey site. 1. What is the name of it? how to buy the rooms because i wil move in two month and i like the last room . I would like to know about image # 7 boys bedroom. Where I can purchase it and the price. You can visit Timidey Spa’s site and find out there. what is the name of the website (besides this site) to get this?? ?